Thank you for considering Chair Covers By Sylwia. From here forward, your event planning experience will turn extraordinary and exceptionally inspiring! For chair covers, linens, Chiavari chairs and all the accessories to make their events truly spectacular, Chicago turns to Chair Covers by Sylwia. From wedding planners to event coordinators, people throughout Chicago and suburbs trust our professionalism and experience to make their events the absolute best that they can be. Our goal.....your complete and total satisfaction from start to finish. Outdoors, indoors or under a canopy, small parties or large events, rent only or choose our full service, we will help coordinate that perfect ambiance. Our full array of linens will compliment any style and the results will be astonishing. Create your theme, and we will create your dream! Our exceptionally large inventory has most colors and fabrics to meet your needs. Whether your fabrics require a soft subtle shine or a sharp elegant flair, our chair covers and linens will ensure that optimum appearance. Our large display showroom will make your event planning trouble free and you can envision the results immediately! When we are finished, your special occasion will look breathtaking and extravagant where even the most finicky of guests will be delighted! Leave all the worries to us! 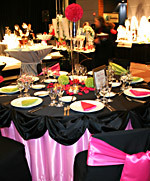 We have many versions of tying sashes, bustle your table linens, and decorating ideas. 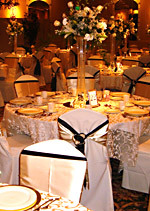 All of our chair covers and linens are cleaned and pressed before every set up. Each chair cover has our special attention to detail and perfection and we adjust, tuck, fix and double check each and every chair cover to make it look uniform and consistent. 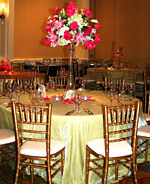 Our chair covers and linens come in custom sizes for different type chairs and tables to give you a perfect finish. Most importantly, our company ensures you can contact and speak with our personnel readily prior to or on the day of your event for peace of mind or emergencies.